Plays by Rafael Compta and Carles Quilmetas. 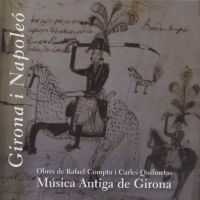 Música Antiga de Girona (Ancient Music of Girona) will release its second CD with unpublished compositions from the Cathedral Music Chapel, which have been preserved in the chapter archive and date back to the period of the Napoleonic sieges. Those are works that show the cultural activity in Girona in 1800 and their evolution in the musical field, with both classical and modern styles represented by Rafael Compta and Carles Quilmetas. Girona, placed among the French border and Barcelona, will suffer three sieges in 1808 and 1809 which will entail the disappearance of half of its inhabitants, material damage and the stay, for some years, of up to 4000 Frenchmen that were trying to control one of the main paths that crossed Girona and which was very important to supply their troops fighting in the peninsula. Resistance will bring destruction, material as well as moral, and will deeply mark the future of the city until our days. The cultural disorder brought about by the sieges will create a feeling of emptiness in the cultured groups of the city. The opposition between the people who supported the French and the ones who opposed them, that is to say between the modern world and the old one, which military deeds will stress, will also be found in comparing the work of two musicians from Girona that we are introducing here: Carles Quilmetas, a violinist and double bass player, and Rafael Compta, chapel master. Both musicians, from a town called Vic, and with practically the same age, worked artistically for the cathedral of Girona, but with quite different musical styles. Carles Quilmetas (Vic 1756, Girona 1775-1834) the first permanent layman of the cathedral chapel was a violinist and double bass player. An instrumentalist virtuoso, he worked more than forty years for the cathedral, bearing the hardness of the sieges and the French presence, a hard period that brought hunger and made him beg the Chapter in order to be able to feed his family. And little more is known about him. The original manuscript of this symphony is kept at the Biblioteca de Catalunya (Catalunya Library) after Carrera Dagas, chapel master between 1851 and 1890, sold it in 1900 to the Diputació de Barcelona together with other remarkable scores from the archives of the cathedral, concealing the origins in the catalogue that was published afterwards. At the end of the XVIIIth century the work of Haydn was very well-known all over Europe thanks to the new musical spaces that the bourgeoisie had created. In Catalonia, where the new bourgeois public was increasing, this composer will have a remarkable impact while in the rest of the state he did not arouse great interest as this process of modernization did not rely on such institutions as the Church and nobility. The composers success had to be found among the new public, who would pay to be able to enjoy these new compositions. Rafael Compta: (Vic 1761, Girona 1794-1815) occupied the post of chapel master in 1794 in full Great War, after his brother resigned and despite having failed his exams. Immediately he asked for a wage increase, which was granted to him, in order to be able to earn his living and that of the four altar boys from the choir that he was in charge of, as the prices had increased because of the war. Three years later, however, he was penalized for not having taken enough care of these altar boys, since they were badly clothed, did not get enough food and they were not properly educated. Those were the years when he was preparing to be ordained a priest. As a composer he achieved remarkable prestige thanks to the fact that his compositions did not break with the past and had certain distinction, and even some of them were played in Madrid. His health must have been poor since more than once he had to leave the city to recover. He died in August 1815, while coming back to Girona from his native town Vic. Provisionally we can say that his style is that of a composer who does not venture into innovation and who keeps on using the former musical resources with few changes, as for example in his scarce use of the viola. Melodies are theatrical and popular at the same time. As a chapel master he might have felt obliged to make a personal synthesis among the several musical styles that he had known throughout his entire life. Saltando y brincando Villancico burlesco was written at Christmas 1813, with the French living in the city. Burlesco was a type of Christmas carol with many concessions to popular tastes and far from the rigidity of liturgical texts. The lyrics are properly a dramatization of a secondary aspect of the evangelic narration, which avoids any reference to more significant themes. The surprising criticism to the doctors of that time has to be understood as a sign of his illness, as he would die months afterwards. In the text the shepherds, while walking, talk about common subjects, such as food and drink, and besides one of the shepherds is called Malvasia. These details refer to the deprivations he lived in the city at a time of occupation and war. On arriving to the Cave they offer the child some foods, but especially a bolero whose lyrics are against the French invader. That dance was quite fashionable at the Bourbon court and for this reason it is used by the composer to oppose the French style. Compta created a remarkable piece while ridiculing manfredines and bolangeres , foreign dances that some people danced in Girona. All through the composition versification does not come in a natural way more than once, as if the whole text had not been finished off. The lyrics and dramatization are not too successful and the melody shows some Italian influence and rustic quality. Over the years many dramatic elements will be expelled from the cathedral and will be part of the Nativity Plays (Pastorets). Ferran VII Te Deum (1814): Ferran VII arrived in Girona on 24th March 1814 on his way from Figueres and Valençay, where he had been confined for six years. Ten days before, The French had left the city. Ferran VII stayed in Girona for four days and a half, time enough for politicians and soldiers to put pressure on the young king on a very important subject: should the 1812 Constitution be abolished? He will be dogged by this dilemma until the end of his life. His arrival in Girona was spectacular: the royal coach needed more than one hour to go from the Pont Major until Casa Carles, residence of the king, all the streets being crowded. The following day the Chapter received him with that solemn liturgical chant of thanksgiving, sung inside the cathedral with great solemnity . Upon finishing the king climbed down the grand staircase, a scene portrayed in the painting by Bonaventura Planella, a military topographer there present, and that can be seen in the present edition. The composition starts with a brief and peculiar orchestral introduction, based on the well-known burlesque melody Napoleon had a hundred soldiers. This melody is still very popular in Catalonia today, but curiously it is not known in other places of the Iberian peninsula. It is sung suppressing a syllable in each stanza, making reference to the fact that the young farmers recruited by force by the Napoleonic troops when the army moved forward across Europe, left the French army as soon as they could. It is for this reason that the French sing it going from the 500 soldiers of the first stanza to 400 of the second and thus each stanza diminishes the amount of soldiers until zero. After this short introduction the orchestra continues with the Latin text for four voices accompanied by first and second violins, oboes, horns but without viola . The rhythm entails easily perceivable military elements whose purpose we ignore. It is a solemn composition that might have made people forget for some minutes the hardships of the time after years of war and French occupation.